I installed Windows XP Pro fresh on a new machine I built at home. I'd done this several times in the past and was able to successfully see all those machines on the network with no problem. This one was different, however. I could do everything I wanted from this particular machine to the others in my network (pushing/pulling files to other shares on other machines), but I couldn't get the others to talk to this one. The only difference with this computer's install was that it was done from the Windows XP SP3 CD. My prior installs were done on earlier XP versions. It seems the SP3 CD will firewall your connection by default and NOT count "File and Printer Sharing" as an exception. To resolve it, you need to get that Exception enabled (recommended) or disable your Windows Firewall for the connection (not recommended). 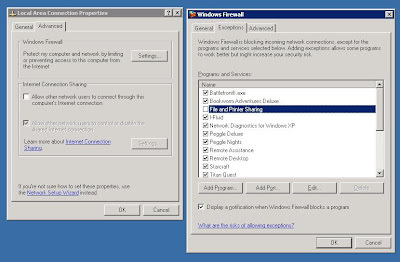 Click OK on the Windows Firewall dialog. Click OK on the Connection Properties dialog. You should now be able to ping the computer by name and access its file shares, etc. on your network.